Principal Cast : Jim Carrey, Steve Carell, Carol Burnett, Will Arnett, Seth Rogen, Amy Pohler, Dan Fogler, Jesse McCartney, Isla Fisher, Laura Ortiz, Jonah Hill, Jamie Pressley, Neicy Nash, Selena Gomez, Josh Flitter, Joey King, Charles Osgood. Synopsis: An elephant hears a voice coming from a speck of dust. Comic hijinks ensue. What we think : Deftly animated, and largely faultless in performance, this film adaption of the famous Horton story ticks all the boxes for success. Yeah, it’s funny, yeah it’s sweet, and there’s enough comic energy for adults to enjoy as well. 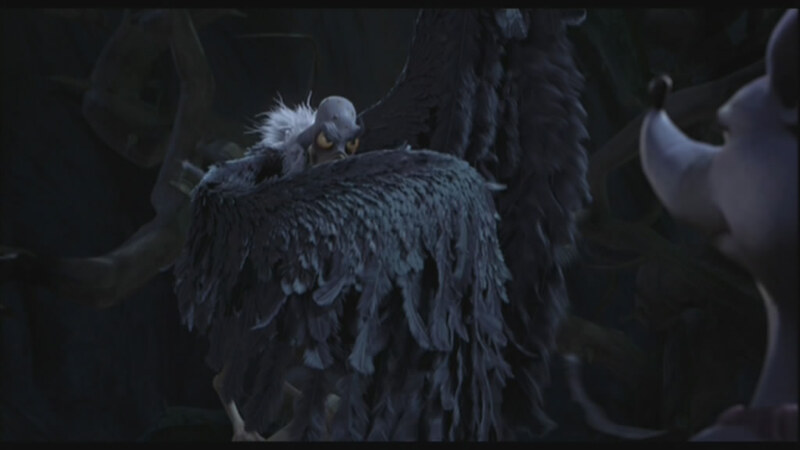 Honestly, I wasn’t really expecting such a cool little film out of 20th Century Fox Animation. Their last escapade, Ice Age 2, hadn’t really done much for me, and I was actually thinking they’d simply deliver another in a long line of mediocre, sorta-cute animated CGI features in a vein similar to Shark Tale or Madagascar. I am happy to say, though, that I was proven wrong. 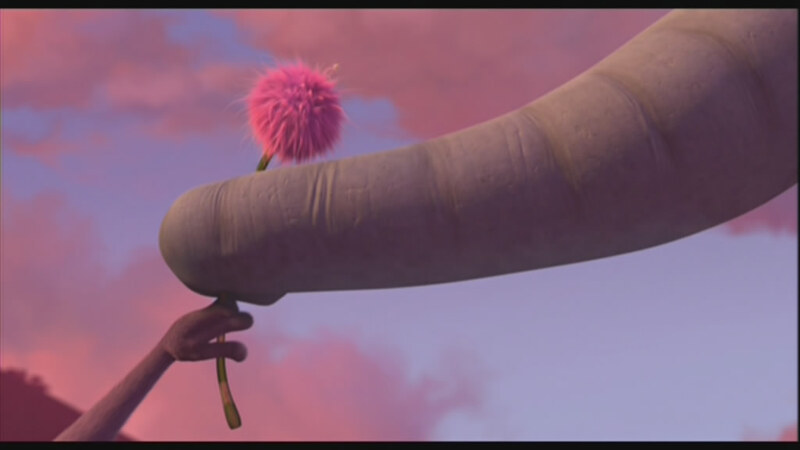 Horton Hears A Who is a great little film, featuring a layered voice performance from Steve Carell, and a pretty wild one from Jim Carrey. Carrey voices Horton, an elephant, who, while taking a bath in a small jungle pond, hears a sound coming from a speck on a strange pink plant. While Horton tries to convince his friends and fellow jungle inhabitants that there is actually somebody, or something, living on the speck, a nasty, ignorant Kangaroo (voice of Carol Burnett, and wonderfully done, I might add!) 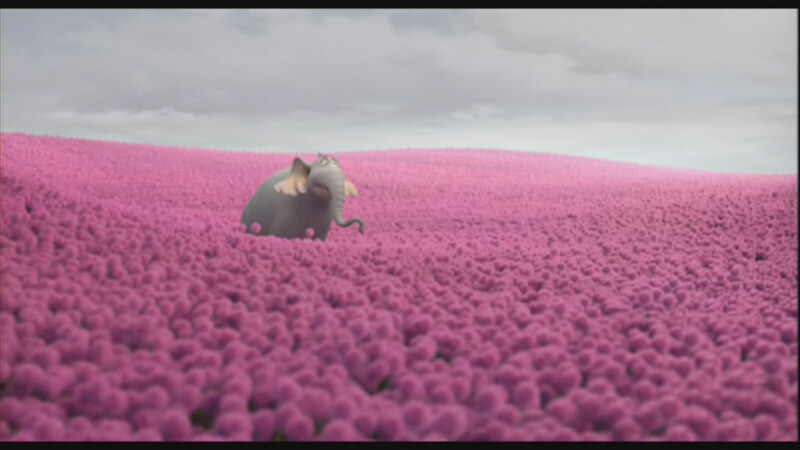 is against the idea of tiny little people living on flowers, so she sets about to destroy the speck, and Horton as well. Horton didn’t know it, but the shark knew he was coming. Horton, engaging in conversation with the little people on the speck, embarks on a dangerous journey through the jungle to find a nice, safe haven for the plant and it’s valuable cargo, all the while being attacked by the Kangaroos’ cronies and other inhabitants of the jungle. Are you sure he went THAT way? Meanwhile, down on the speck, Mayor of Whoville (because, the Whos live there) Ned McDodd (voiced by Steve Carell), is the clamitous character Horton happens to be speaking to, and, similarly to Horton, he can’t get anybody to believe him. Ned is a Who, in lively, traditional fashion, with his hundreds of daughters (and one single son) whom he only gets a marginal amount of time with: and while he’s the mayor in name, he’s not much of a mayor by nature. Horton Hears A Who is Jim Carreys second outing into the world of Dr Seuss, after The Grinch, and while he’s merely a voice here, he puts as much effort into bringing the scattershot Horton to life as he did the furry green Grinch. Carrey plays Horton as a bumbling but good natured soul, an innocent, if you will, with the intelligence and emotional stability of a six year old. Which, from an elephant, is a little weird, but done so well here. Steve Carell, on the other hand, creates a pitch perfect Ned McDodd, and accompanied by a fantastic voice cast to back him up, is the standout role of the film, for me. Carell manages to create a sense of depth and empathy with the forlorn Mayor, whose family line stretches back generation after generation, all of them Mayors, and it’s that feeling of pressure to continue it that gives us pause for concern. Ned’s son, JoJo, is a sullen, angsty teenager Who, who never speaks (like most teenagers) but merely shrugs, and goes off to be by himself. If I play my cards right, a spot in the Plan 9 From Outer Space sequel could be mine!!!! The film look amazing, as you’d expect from CGI animation these days, and the colours and detail in the image are simply astounding. There’s plenty to keep you interested, if you like that kind of thing, and the film has a feeling of round, wholesome entertainment about it throughout. 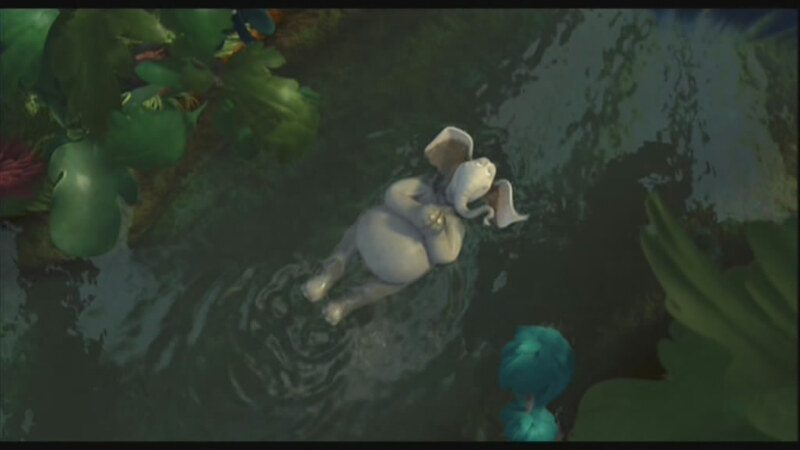 Horton’s design, a frumpy, lovable (cough* imbecilic cough*) elephant is well done, his ability to use parts of his body for other things is great comedy material: to wit, using his ears as a swimmers bathing cap is genius, and always makes me laugh. 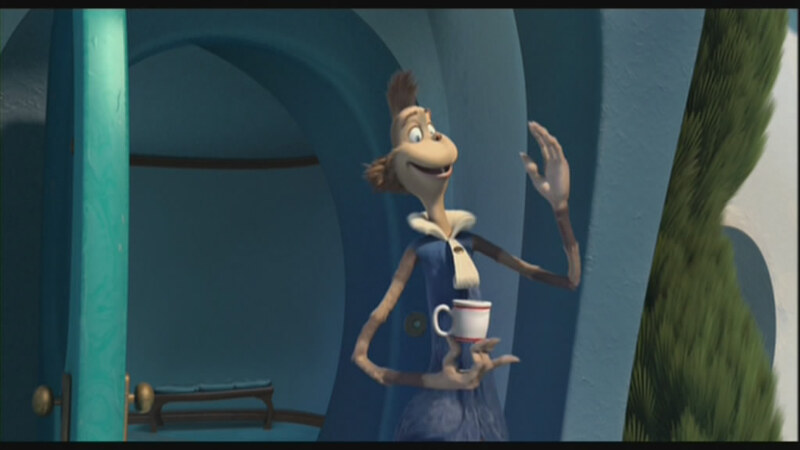 The Whoville design is modelled quite well after Dr Seuss’ original line drawings, the flowing lines and bizarre architecture of the world of the Whos is a stark contrast to the jungle outside the speck. 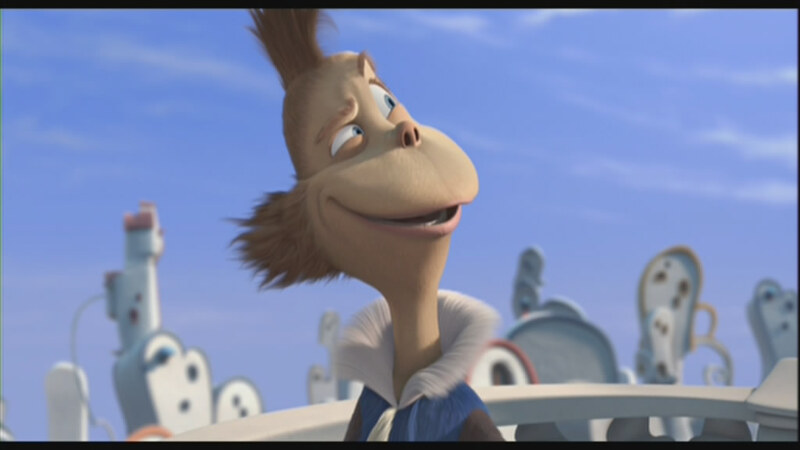 The Whoville opening flythrough in particular, showing us the crazy antics those Whos get up to, is reminiscent of the same world portrayed in live-action in The Grinch, although a lot more widescreen in terms of concept, and a little less restricted by things like, oh, gravity. 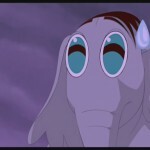 Horton had dropped his contact lens, and the jig was up. If I can be hypercritical for a moment, and as a critical reviewer, I simply must, I have to point out the films one large weakness. Since one of the main characters is portrayed as slightly juvenile, and a little stupid (lovingly so, though! ), it means that any lesson or morals Horton learns throughout the story have to be hammered home with all the blunt brutality of a wrecking ball. There’s no subtle lesson to be learned here folks: tolerance and understanding, and acceptance of a larger world yadda yadda are are things we learn at an early age, and the point of this is reamed into us by both dialogue and story points throughout. 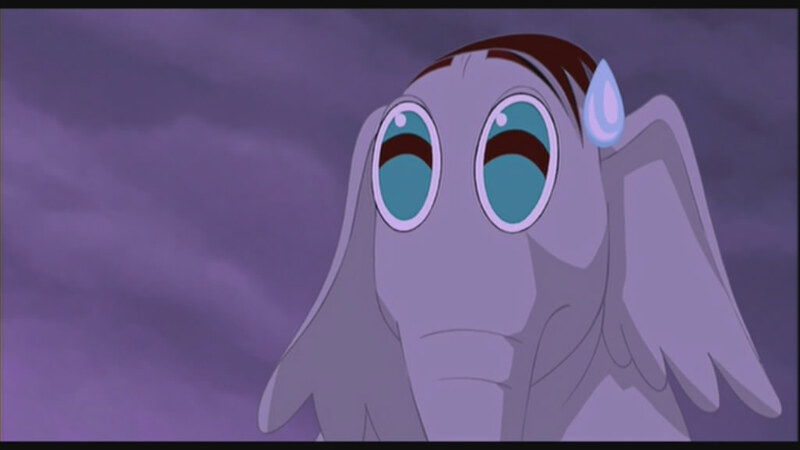 Ned and Horton are different, yes, but they’re the same, you see… misunderstood members of their respective societies. Oh look, it’s a few minutes of dialogue to say that, when we’ve just seen it anyway. 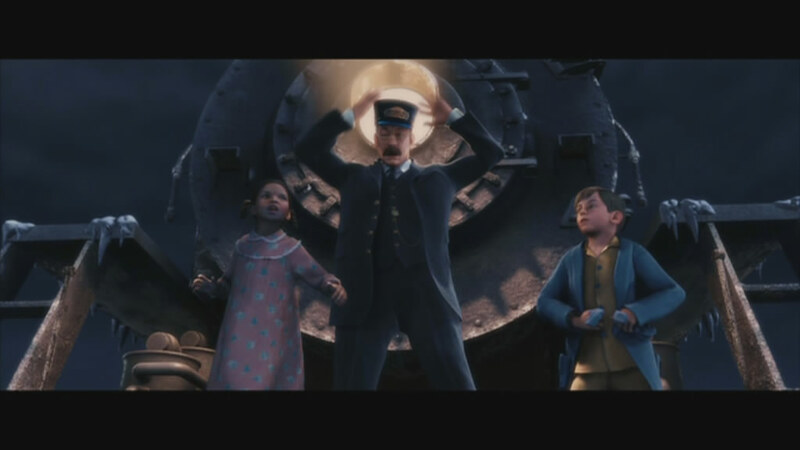 Okay, so kids films are films for kids, and sometimes they need to be pummelled into submission by overarching story writers, and films like this can have a negative vibe in terms of a more adult audience: however, I don’t think the issues with banal subversion to teach us a life lesson should put you off this wonderful film. Hortons Pokemon experience did NOT go well at all. Musically, John Powell has given us yet another stunning soundtrack, and is fast becoming one of the best score composers in Hollywood. Powell’s ability to craft a story out of the music, to bring the characters and the film to life with panache (unlike Hans Zimmer’s more alternative approach, which is to bludgeon viewers into submission!) is a credit to him, and here, he’s done a bang up job with the films score. See dear, I CAN hold a coffee cup normally!!! To be honest, I was pleasantly surprised by the quality of this film. I went in with low expectations, and came out the other side actually pleased that the film had done a great job of entertaining me. With this in mind, I can thoroughly recommend Horton and his friends to you. Well done!